The first American woman to go to space was immortalized on the Forever stamp in a dedication ceremony from the United States Postal Service Wednesday. 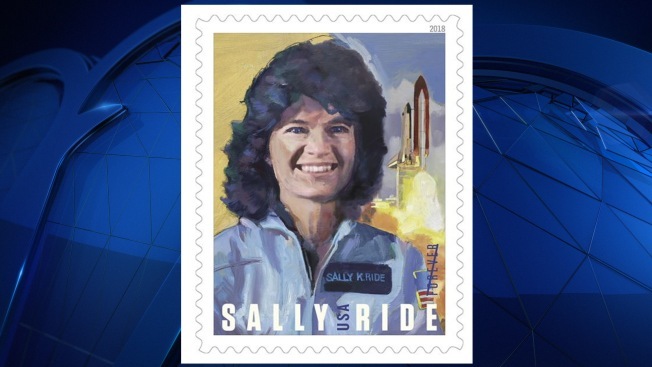 The Sally Ride Forever stamp was dedicated at the University of California, San Diego, where Ride was a physics professor after her time with NASA. Tennis legend Billie Jean King, a friend of Ride's, spoke at the ceremony, along with Ride's long-time partner, Tam O’Shaughnessy. The celebrated astronaut launched for the first time on June 18, 1983, aboard the space shuttle Challenger. During the mission, she helped launched communication satellites and became the first woman to operate the shuttle's robotic arm. Ride, who died in 2012, continued breaking records during her career. She also became the first American woman to travel to space twice when she launched on another Challenger mission in October 1984. Ride was also the only person to serve on the accident investigation boards for both the Challenger and Columbia disasters. And in 2009, she participated in the committee that helped define NASA's spaceflight goals. In addition to her involvement with the space program, she wrote several science-related books, some co-authored with O’Shaughnessy. Ride and O’Shaughnessy went on to found the education company Sally Ride Science, which aims to narrow the gender gap in science, technology, engineering and math. O’Shaughnessy now serves as the organization's executive director. A Forever stamp will always be in equal in value to the current First-Class Mail one-ounce price.